In this article, we'll cover some usage examples of how you can utilize Essential Grid within your X or Pro powered site. We'll mainly be focusing on how to use Essential Grid and so may skip over some finer details. Note: This article covers only a small portion of what you can achieve with Essential Grid, make sure you take a look at the official documentation which is linked to in the Documentation section below to explore the full possibilities of this powerful tool. As we mentioned further up, we're only going to cover how to use Essential Grid and not every option it provides, to learn more about Essential Grid check out the official documentation here. Custom Product showcases. Use Essential Grids custom post type feature to show off products from different categories on different pages, perfect to keep the focus on one set of products, rather than having a overall shop page. Custom post pages. Use Essential Grid custom post type feature to show posts from selected categories or with selected tags on different pages, perfect to have a page per category or per taxonomy (category/tag). Showcase your products or posts at the end of a product or post with a Essential Grid inserted. Perfect for an upsell or cross promotion. 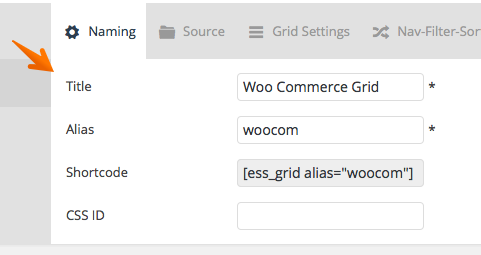 Let's go through the options and create a Essential grid for our WooCommerce products. First up, you'll be on the "naming section" with the following options. Once you've done that click on the Source tab. For the purpose of this tutorial, we're going to select our clothing category, which means that all products in the clothing category will show in the grid. It's also worth noting here you could select multiple categories if you wished. Another option you'll see on the source tab is one called Maximum Entries setting this will define how many entries the grid can have, setting that option to -1 will disable that option all together, in theory allowing for unlimited products to be shown on our grid. As you can see there's quite a few various media options, but as this is products, we're going to want to just select Featured Image this will mean that if we have set the featured image of our WooCommerce product, Essential Grid will take that image and output it in the grid for your product selection. Under that option is a option to set the Default Image this is a useful option if you don't always set featured images for your products and still want a image to show on the grid, setting this will ensure a image always shows. 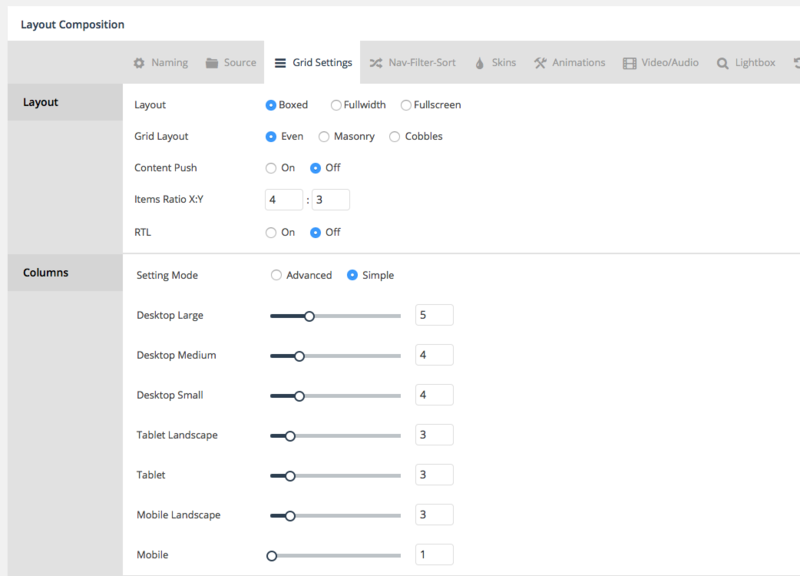 It's worth noting here that if under Layout, you select Fullscreen the Grid Layout, Content Push and Items Ratio options are no longer available to set. For the purpose of this article, we're going to stick with Boxed, but you can choose any option you'd like. 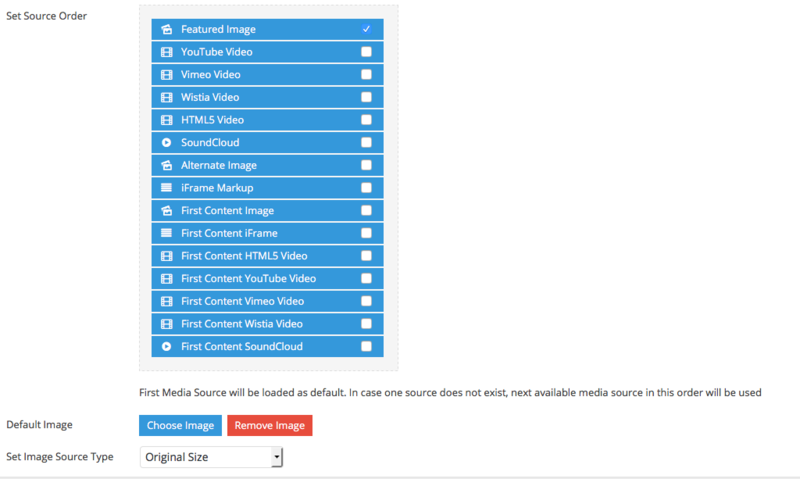 Note:If you choose to use Fullscreen or Fullwidth, you'll need to review the selector options provided by Essential Grid, as the grid will expand outside of the content area, potentially causing layout issues. You can review those docs here. The next options are for how many columns displaying on different screen sizes, you'll notice that there's a Advanced mode option, this actually allows you to have greater setting over custom breakpoints etc, but we won't be covering that in this article and will just be leaving all those options as they are. Feel free to experiment though and find a way that's perfect for you. All the following items on that page we'll leave as they are too. Which is Lazy Loading, Item Spacing and Whole Grid Padding. Again you don't have to leave these as they are, so feel free to play about with the options and find the perfect settings for you. Now go ahead and click on the Nav-Filter-Sort tab, you'll see a lot of various options on this page, we'll just cover the ones we actually need for our grid. 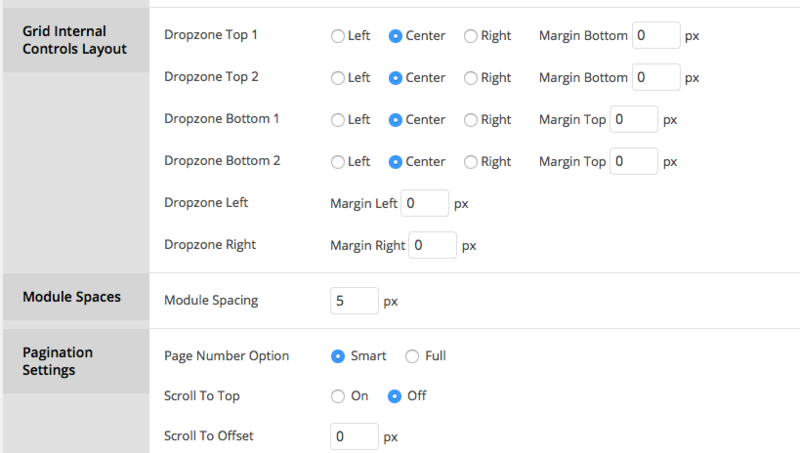 As you can see we have a bunch of different modules available to us, which we can have inside our grid, the modules are drag and drop, drag Pagination into Dropzone bottom 1 and drag the Cart module into Dropzone Bottom 2. 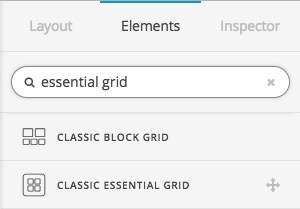 Further down that same options page, you'll see various other sorting options and filter options, which as explained we won't be covering them all, but there's some great info about these options in the official documentation of Essential Grid. For the purpose of this article, we're going to leave all those options set to default. 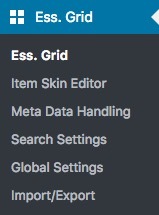 Next up click on Skins here you'll see various different options that allows you to change the skins/styling of your Essential Grid. For the purpose of this article, we're just going to leave it set to Minimal Light with the default background color. You can also check out the official documentation on Skins here. The rest of the available tabs and settings/options don't really apply to the purpose of this article and for more information about the various settings/options you should refer to the official documentation as mentioned at the beginning of the article. If we change our Essential Grid settings to not be paginated and instead show all our clothing products in one grid, the frontend of our site would then look like this. As you can see by changing one simple setting our Grid is now completely different, with the wealth of options Essential Grid provides, your sure to find a setup to suit your needs. Release Cycles – While we try to include the latest version of Essential Grid with each release, occasionally the release cycle of the plugin will prevent this from being possible. Essentially, since we have no idea when Essential Grid will be releasing new versions of the plugin, we cannot plan our releases around this. Because of this, if we have already begun the process of finalizing our release and submitting it to ThemeForest for review while Essential Grid is putting out a new version of the plugin, that version of the plugin will not be able to make it into the theme until the next release at the earliest. 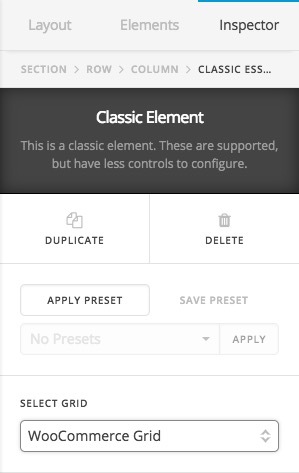 Not Always Necessary – Some of Essential Grid's releases have only included simple "bug fixes" without any huge additions or modifications to the rest of the plugin. Because of situations like this, it is up to our discretion whether or not a new release will make it into the theme or not based on the nature of the update. Because of these reasons (among others), there is no need to register your license for Essential Grid if you happen to have one. In fact, doing so is discouraged in order to prevent any potential conflicts when updating, as previously mentioned. If you happen see a notification in your WordPress admin panel asking you to register Essential Grid upon activation, simply dismiss this notice. Essential Grid is a extremely powerful and flexible plugin that will assist you with creating the perfect website. The version of Essential Grid included with the theme is an unmodified version of the plugin. We do our best to ensure that the version of Essential Grid included with X or Pro is as up-to-date as possible; however, this might not always be the case based on the reasons listed in the "Bundled Version" section above, which includes stability, release cycles, and the fact that not all updates are necessary. Any questions concerning the usage of a Essential Grid feature should be directed to the online documentation referenced in the "Documentation" section above. 2 Filters for the Portfolio Site possible? How to display all posts with pagination? Is it possible to create a grid format to display logos in? Creating just a "image gallery homepage"
About page - Can one of your extras do this? Show all products in SHOP page? Should I use a portfolio or blog or shop template? Squared up 5 Column Row for Pics & Text and Unwanted Extra Space! Classic post element - how do I show all posts or have pages? How to use Essential Grid? How to activate Essential Grid? How to add rotating shop items to front page? Whats the best way to display woocommerce products on the homepage? Styling lightboxes in X Pro? Block grid image size cap? Envira Gallery Mobile Lightbox not Resizing - Fixed Yet?